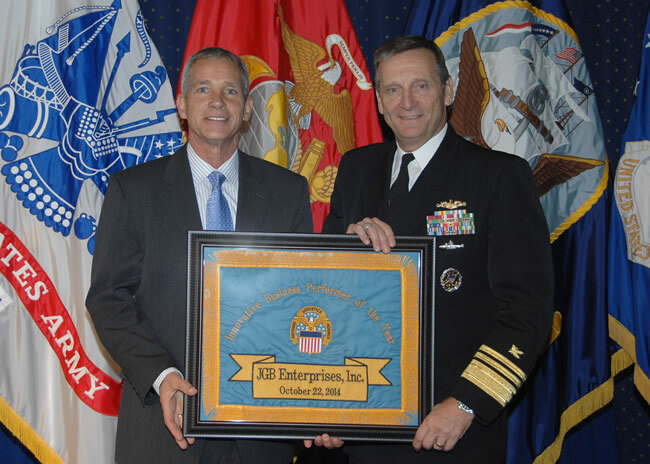 JGB was awarded the DLA Innovative Business Performer of the Year - Current News at JGB Enterprises, Inc.
JGB Enterprises, Inc attended the Defense Logistics Agency (DLA) Business Alliance Awards Ceremony held in Fort Belvoir, Virginia on October 22, 2014. JGB was awarded the DLA Innovative Business Performer of the Year - Award for Business. The award was presented by Vice Admiral Mark Harnitchek, Director of the Defense Logistics Agency. JGB's Director of Government Contracts, Marty Salanger was on hand to accept the award. We were nominated for this award by DLA Land and Maritime located in Columbus, Ohio. It is an honor to receive this prestigious award and all employees should be proud of their support to DLA and take great pride in support of America's Warfighters. Thanks to all for their continued contributions to JGB's success.